Prince Fielder, Home Run Derby Participant ~ The Bucky Channel - The World of Sports from Wisconsin's Perspective. The four first basemen that will represent the NL for in the All-Star game will also be representing the league for the Home Run Derby. Prince Fielder will join Adrian Gonzalez, Albert Pujols, and Ryan Howard to see how many of them can hit the best batting practice on Monday night in St. Louis. Prince's last Home Run Derby was in 2007, although his total of three was not enough to advance him past the first round. Even though Pujols is the starter due to the fan voting, I think it would be interesting if they put the starting spot on the line between the four of them. Whoever hits the most home runs, gets the starts. It won't happen, but I really think that'd be the only way Prince would get any time in this game. Pujols will start, Howard will get in second because Charlie Manuel is the manager, Adrian Gonzalez will be next because he's the players vote, and then they'll shove Prince in there if they have time. That's the gut feeling. But I guess that's not really the most important thing. The most important thing is that Prince has a good showing in the Derby, without messing up his swing of course! Hope he does well. 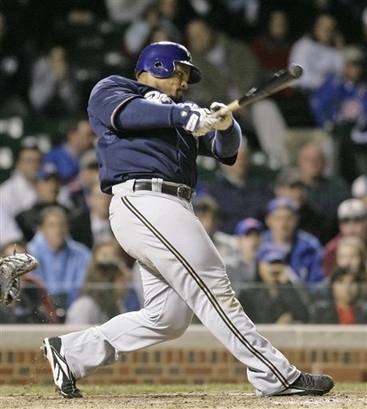 Check out this funny satire article about Fielder.